In 1930, Hawks convinced Texaco to back a proving flight that would demonstrate the effectiveness of gliders. As a reserve officer in what was by then known as the United States Army Air Corps, Hawks foresaw the military usefulness of gliders, and despite a lack of government support and critical reaction from seasoned glider pilots, Hawks mapped out a transcontinental flight. 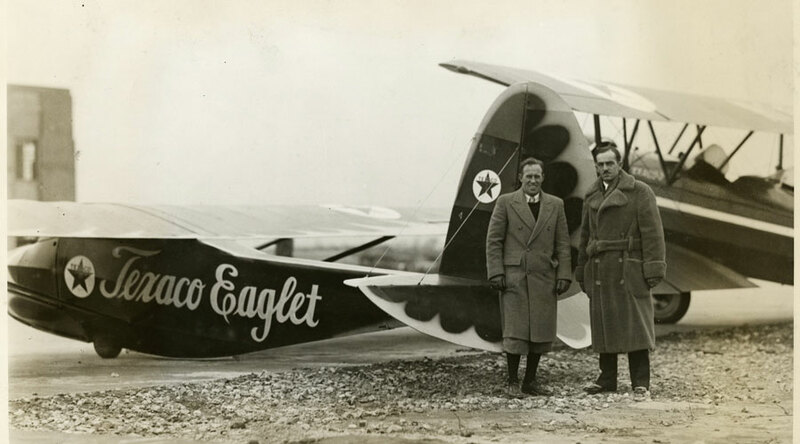 The appropriately named Texaco Eaglet was a custom-made 50-foot wingspan glider built by R.E. and Wallace Franklin. Designed to achieve a maximum speed of 125 miles per hour, it was fitted with a two-way radio and telephone connection with the tow plane, the "Texaco 7", a Waco ASO biplane, flown by J. D. "Duke" Jernigan, Jr., a member of Texaco's domestic sales division. The flight left San Diego on March 30, 1930, with Hawks being attached by a 500 ft towline, taking eight days elapsed time and 44 hours, 10 minutes of actual flying time. Hawks also spent 10 hours in soaring exhibitions at scores of towns and cities along the route. Surmounting all the predicted obstacles, even the Rocky Mountains which German glider pilots had feared would jeopardize the flight, only occasional turbulence was encountered. Hawks arrived in New York on April 6, 1930, effectively proving the feasibility of long-distance glider-towing. Frank Monroe Hawks (March 28, 1897 - August 23, 1938) was a pilot in the United States Army Air Service during World War I and was known during the 1920s and 1930s as a record-breaking aviator, using a series of Texaco-sponsored aircraft, setting 214 point-to-point records in the United States and Europe.